3 Bedroom Terraced House For Sale in St Albans, Hertfordshire for Asking Price £835,000. Part of Maryland Place, by Beechcroft Developments, is a 3-Bedroom, 3-Bathroom Mid Terrace home, part of a collection of 35 newly-built homes designed exclusively for the over 55s. 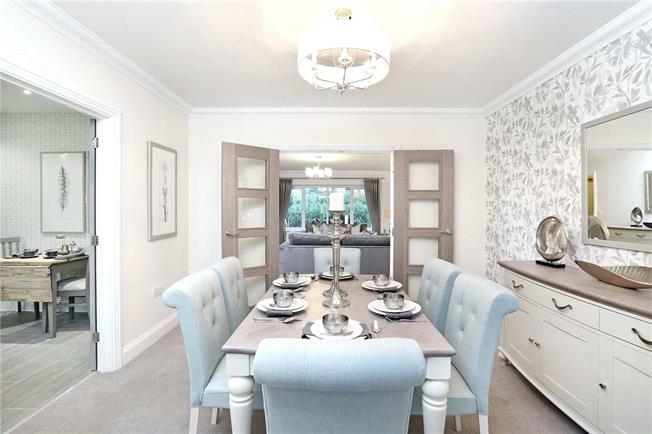 The home includes a fitted Kitchen, reception rooms, Master Bedroom with Dressing Area, Terrace & Garden. including a single oven, a five burner gas hob, combination microwave/oven, fully integrated dishwasher and fridge/freezer and a washing machine and tumble dryer in utility area. Stainless steel sink and mixer tap. Choice of ceramic floor tiles to Kitchen, Sun room and Cloakroom ( Subject to stage of construction). - Ensuite Bathrooms with contemporary white sanitaryware from Villeroy & Boch, fitted vanity units, ‘Vado’ taps and fittings in chrome. Curved chrome heated towel rail, Shaver sockets, choice of ceramic wall tiling. Full height ceramic wall tiling on the appliance walls in En-suites ( Subject to stage of construction). Choice of Amtico flooring to En-suites ( Subject to stage of construction). Mirrors fitted in En-suite Bathrooms and Cloakroom. - Dressing Area to Master Bedroom and fitted wardrobes to Bedroom 2. - Cornice to Drawing room, Dining room and Hallway. Coving to all remaining rooms with the exception of Kitchen, Ensuite Bathrooms, Sun room and rooms with sloping ceilings. Moulded skirtings and architraves. - Low energy fitment pendant lights. LED downlights to Kitchen, Ensuite Bathrooms, Cloakroom, Sun room and Dining Hall where applicable. Telephone points to the Drawing room and Bedrooms. Communal satellite dish and TV/radio systems compatible for Sky+ system and Sky HD. - Window locks to all windows. Security alarm fitted with panic buttons in the Master Bedroom and by the front door. Mains operated smoke detectors with battery backup and mains powered Carbon Monoxide detector. Sales office and Show Homes open Tues-Sat from 10am-5pm. For further information and to arrange an appointment, please contact Preston Bennett New Homes on 0208 954 8626.